...flowing through the tap lines of my miiiind. I recognize the fact that it's spring. It's been less than a month since I sang its praises. Mother Nature is still sorting out her schedule. The pollen is bringing all sorts of drama to your sinus cavities. But I need to hit fast forward for just a moment. Because according to my tastebuds: it's summertime, kids. Time to start working on your Marco Polo. Brewed by the same badasses in Michigan who brought you Hopslam, Bell's Oberon is my warm weather staple. From its release in March until the last cannonball hits water in September, the first thing you'll see when you open my fridge is that bright, cheery, orange label. 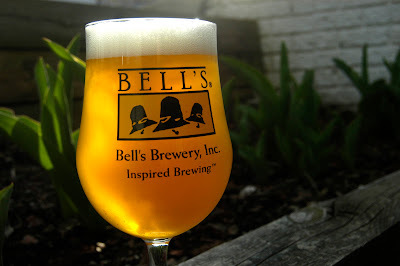 Oberon is an example of what all wheat beers should strive to be. The smell of coriander, orange peel and fresh, crisp Saaz hops carry over onto the palate to create a multisensory drinking experience. And look at that body. Hazy, golden, effervescent. If that's not summer in a glass, I don't know what is. Lawn clippings in a melamine tumbler would be quite summery, actually. If you're a fan of that one wildly popular wheat beer named after a celestial body, give Oberon a go. I think you'll be pleasantly surprised. All right, I'm done. Back to spring and all of the glorious loradatine tablets that it brings. We'll be there with Bell's on. Thanks to this blog I jumped into one of these last night at Lost Dog. I was impressed, only to be let down soon afterward at the news that it wasn't available in a 6 pack to take home. Chin up, young chap. I'm sure the Whole Foods in Arlington has many a 6-pack to fulfill your thirsty urges.